Another leftover roast beef sandwich is Hot Roast Beef Sandwich with Melted Cheese and Caramelized Onions. When I make a sandwich, I like using good crusty bread like a baguette or French bread, which is a perfect fat free bread option. A trick I like to do when I make a sandwich is to scoop out some of the inside of the bread, which allows me to make a larger sandwich, and it leaves room for the meat and lettuce. I personally enjoyed most of my sandwiches dry but if you prefer adding mayo or dressing, you’ll have to adjust the points. I bet horseradish mayo would be lovely on this! I’ve been getting lots of emails from working folks who need help preparing quick and easy lunches on the go that don’t require heating up the kitchen. I am dedicating the rest of the week to healthy sandwiches. 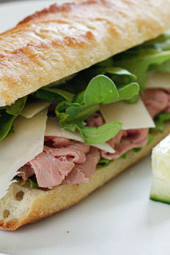 If you have a sandwich you would like to share with everyone feel free to comment and maybe I’ll post your recipe! 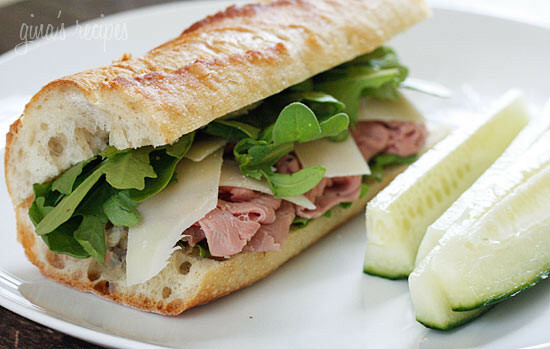 Slice bread in half and layer with roast beef, arugula, shaved Parmesan and fresh cracked pepper. I make a similar sandwich on home made onion bread – add tomato slices and this dressing: equal parts Dijon & Hellmanns mayo, then add horseradish to taste. I just found your site and I love it! My count for sodium is 403 mg, not 148. My count for protein is 9 g, not 22. It was also fewer calories that what's listed here, but you won't hear me complaining about that. Looks great. Definitely worth a try. Just another keeper to add to my list of WW friendly recipes! I just made this for lunch today!! Wow–it was amazing. I added a little dijon! 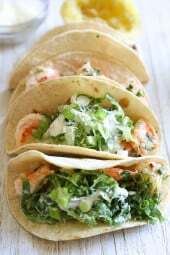 I will definitely be making this every week! I love this sandwich!! I add a little greek yogurt (0% fat plain)for a little moisture and tang (not a fan of Mayo, and love the perks of greek yogurt). Can we print these recipes? My husband and I just made this for dinner and it was awesome!! I did use a little of the Kraft Horseradish/Dijon Mayo and I loved that little bit of spiciness it added to it. About how many inches of these types of bread do you suppose 2.75 oz baguette or French bread is? Made this tonight… it was AWESOME! 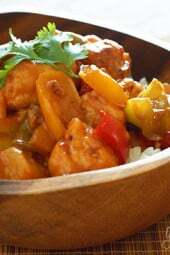 Very quick and easy, but still yummy and filling. I added some light mayo mixed with chopped basil. We'll be making this one again and again! I made this last night for when I went to work today. I couldn't wait to get to work just so I could go on break and eat this scrumptious look sandwich. All of my co-workers kept asking me what was on and said "I want one!" It was soooo good and hit the spot. Definitely filled me up and can't wait to eat the other half tomorrow! This is definitely one of the best sandwiches ever! This looks so tasty! A fave of mine is chicken salad made with mango salsa, low-fat mayo (could also use yogurt), chicken breast and green onions. Gina- hmm!! Isn't that something! Anon- I did too!! It was always my favorite sandwich there and then I started making them myself. So easy! I USED TO EAT THIS SAME SANDWICH ALMOST EVERYDAY FROM A PLACE CALLED PRET I LOVE IT BUT BEING MIDTOWN MANHATTAN IT GOT REALLY EXPENSIVE I NEVER THOUGHT TO MAKE MY OWN AT HOME AND BRING IT IN. Last night my husband was just going on an on about how he wanted a roast beef sandwich and a pickle for dinner and low and behold today this is your blog post. Coincidence? I think not. jenn- steak sandwiches are my weakness!! mary – I have a few lightened up chicken salad recipes. Light mayo and some fat free yogurt would work perfectly! I found my dinner for tomorrow, Thanks to a friend!! looks delish!!! 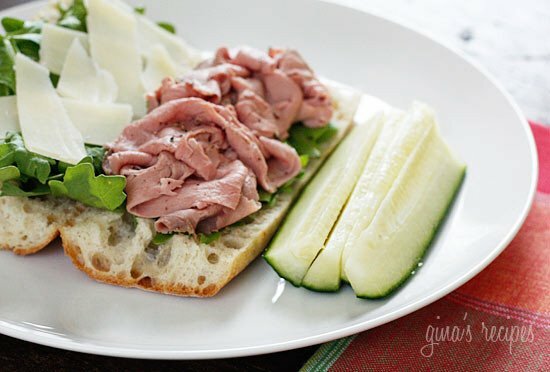 I am not a lunch meat fan, but I think this sandwich would be FANTASTIC with some thin sliced flank steak! Thanks! I love you blog Gina. We cook dinner off it every week! 🙂 Thanks for providing fresh, healthy and easy meals for my family and I! 🙂 My favorite sandwiches are grilled cheeses – I love finding new and unique ways to make them and stuff them (with vegetables – esp with like sprouts and tomatoes)! anon, french baguettes contain flour, water, salt, and yeast. Nothing else. I should say it's usually fat free but check your labels. Once in a while I see some made with fat but 9 times out of 10 it's fat free. Looks great. See my latest post of chicken salad. Any tips on making it a skinny recipe? How are these breads fat free? 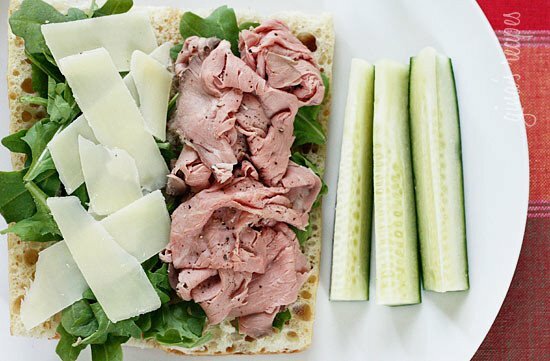 Love all your sandwich ideas! I buy Boar's Head ROast Beef. Yum! Our favorite warm (but not in the heat your house kid of way) sandwich is to take a high quality bun or kaiser roll and stack it with some deli sliced roast beef and sliced swiss cheese. 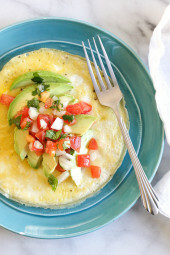 then take a half a brick or reduced fat or fat free cream cheese and stir it together with a small can of mild roasted green chilies. Spread some of the sauce mixture on one side of the bun and microwave (yes…I promise it is delicious!) each sandwich for a minute. The cheeses get gooey and the whole sandwich is delicious. We call it Philly and Swiss at our house. Thanks Gina, what an a-mazing idea!! I'd love to know what kind of roast beef this is as well! It looks perfect! Gina, what is your roast beef of choice? I like a sammy with turkey, smoked gouda, sliced apples, and honey mustard. Another favorite is grilled chicken, taboulleh, and hummus on a wrap, I like Josephs lavash bread its really high in fiber. Thanks for sharing the fat free bread options! Learn something new everyday! I just found dinner thank you!! !Looks delish!